Having a town named for you happens to very few people, but Hiram Robert Pollock was a man in the right place at the right time for this honor. H. R. Pollock, “Hime”, was a lumberman in Michigan. He had been born there in Hersey, in 1865. 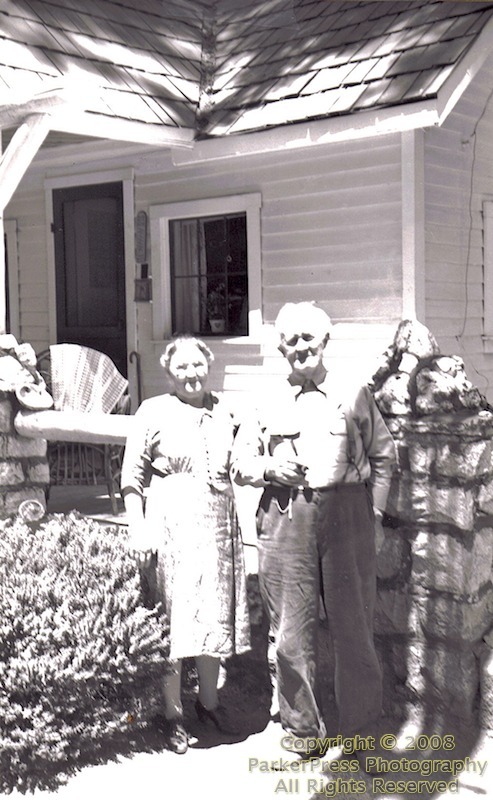 He came to El Dorado County with his wife Anna and son Claude Earl after the turn of the century and brought with him the knowledge of the logging industry. In June of 1909 Pollock bought 240 acres near Sly Park and sold it less than a year later. He was involved in land and timber rights throughout the area for the next several years. He became acquainted with Mr. Poole who ran Pacific House and through him met Mr. Sheer. Pollock and Sheer started a lumber mill near Pacific House with Mr. Sheer providing the capitol and Pollock, his knowledge of the lumbering business. Through this venture they became acquainted with Mr. Kramer and Mr. DiGeorgi of Sacramento, who were affiliated with the fruit storage and shipping business. Fruit at that time was being shipped in wooden boxes as far east as the Mississippi River. They struck a deal to build a mill to supply lumber of box grade quality to companies in Placerville and Sacramento. The mill was to be located at Weber Creek east of Sportsman’s Hall. Pollock again was to provide the know how and be in charge of the operations. Mr. DiGeorgi was to put up the money to buy the land and build the mill. The land was acquired, the mill begun, and things were beginning to take shape when the depression of 1929 hit. DiGeorgi ran into financial difficulty and wanted to sell out. The federal government would buy 150 million board feet of lumber at $1.50 a thousand feet. This was enough to allow DiGeorgi to break even for the cost of the land but not enough to meet his obligation to Pollock. The original agreement between Pollock and DiGeorgi was that Pollock would receive a percentage of the stock in the company that was to sell to the box companies at a price of $2.00 per thousand feet of timber. The government offer left DiGeorgi about $75,000 short and it was agreed that Pollock would gain title to the 6000 to 7000 acres of land and the partly finished mill in exchange for the shares he would have received. Hiram Pollock borrowed money to finish the mill and get it in running order. The mill itself was located on Weber Creek below Sportsman’s Hall. The logs were brought to the mill where they were cut into lumber. The canyons were steep, necessitating the use of a tram to take the cut lumber up the hill to the drying deck. The tram was a railroad car on tracks pulled by means of a cable attached to a donkey engine at the top of the hill. The cars could return down to the mill by gravity. The drying deck was about one quarter mile east of Sportsman’s Hall next to the road. Hiram and his son Earl worked many long hard days struggling to meet the payroll demands and keep the mill running. In 1932 the insurance company informed them that the rates would raise $5000. A sum which even today is a substantial amount. Consequently the insurance was dropped and the Pollocks’ worst fears were realized. Within 30 days a fire swept through the mill, totally destroying it. Pollock salvaged some of the equipment to sell and he still had the land. The road along the ridgetop in front of Sportsman’s Hall was again hosting travelers, this time on their way to Lake Tahoe for pleasure. Many of these people would stop and inquire about land or cabins for a summer home in the area. As more and more inquiries were made, the idea to sell parcels of land began to surface in Hiram Pollock’s mind. This would allow him to regain some of his losses. Much of the land to be subdivided had previously belonged to the John Breuner Co. of Sacramento. It ran along the ridge top on either side of the Cedar Grove School. Mr. Chapdelaine, a friend of the Pollocks, suggested the name of Pollock Pines. A subdivision map was filed. The subdivision went from Manzanita Street on the west end to Oak Street on the east. It is said that lots sold for $5 down and $5 per month. Signs on either end of the subdivision announced arrival in Pollock Pines. A post office application was granted in that name and soon the name of the school was also changed from Cedar Grove School to Pollock Pines School. 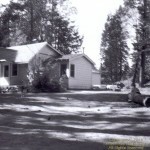 As the population in the area grew and the number of buildings increased, the area known as Pollock Pines became larger and larger. It is an unincorporated area, thus the boundaries are undefined. Mrs. Anna Pollock attended all of the school activities even though she had no children in school. To each eighth grade graduate she would give a check for $1. She was a very active person and often had her kitchen remodeled. One time a contractor would not build a part as she wished. Her husband agreed with the contractor, so she simply removed the part she didn’t like with a wrecking bar that night. When the Brown Mill (located on the site of the present Community Church) burned down and Frank Brown moved, the Pollocks moved into the two story white house he had occupied (just east of the church). 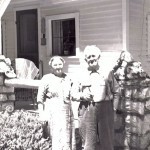 Mrs. Pollock died in December of 1949 and Mr. Pollock moved to Sacramento. He died in February of 1952 at the age of 86. They had been married for over 60 years. Much of this information came from a paper written by Keith Pollock, whose grandfather, Elmer Pollock was Hiram’s Brother. a cousin to H. R. Pollock. Elmer’s and Hiram’s fathers were brothers.